Wet-wipes are a nightmare for sewerage systems the world over, with estimates placing the damage they do when flushed into Australian urban utilities' systems at more than $15 million each year. 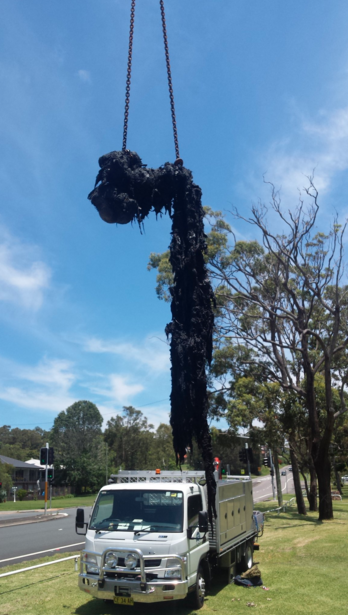 Earlier this year, a Hunter Water Corporation crew used a crane to pull a 750kg amalgam of sewerage and wet-wipes from an underground pipe near Newcastle (pictured), which had damaged the Eleebana sewage pumping station. A further 300kg was removed by crew members using buckets. It is not just a problem in Australia – New York City’s wastewater management reports removal of blockages involving wet-wipes has cost $18 million in the past five years. The issue has also received considerable attention in the UK, where Thames Water (which manages London’s water systems) estimates removal of blockages cost more than AU$22 million annually. There is currently no clear standard on what can be flushed down the sewer or what constitutes appropriate labelling, and some manufacturers have come under fire for marketing wet-wipes as “flushable”. To tackle the issue, an international standard is being developed to create universally acceptable guidelines for what can be flushed. Water Services Association of Australia (WSAA) Manager Utility Excellence Dr Greg Ryan says the standard is due to be finalised in the next 18 months. Standards Australia has recently approved the formation of an Australian Mirror Committee for the ISO standard based on a recommendation from WSAA, the Australian Food and Grocery Council (AFGC) and Accord, the peak body for hygiene products. Dr Ryan says wet wipes are not only a financial drain. “It is also the impacts on the environment, with wipes being found in rivers and on beaches,” he says. The main guidance that manufacturers are using was developed by US and European wipes manufacturers. Ryan says water utilities in the US are now being involved in the development of the next iteration of these guidelines (GD4), which are currently seen as inadequate by the US water industry. “We are watching the developments here with interest and WSAA has observer status at their meetings,” he says. A working group for the flushable products part of the Standard will convene in late May, and will provide input into the next International Standards working group meeting in June. Dr Ryan foresees several challenges for the working group in developing international standards. Firstly, the standard needs to be universally understood and applicable. “It is an international standard, so ensuring the language and terminology is agreeable to all nationalities and doesn’t become too generic to lose meaning will be tough given the number of parties involved,” he explains. It will also be tough to gain agreement on the key definitions of what should be flushed down the toilet. Both of these may be superseded or augmented by developing criteria around disintegration. Dr Ryan explains if a wipe disintegrates well it won’t interfere with pump performance or pass through a sewage treatment plant. “The catch is in determining what disintegration means in terms of how long does the wipe have to be in water to disintegrate, does it have to be agitated, what size of wipe parts constitutes disintegration- a 1mm square, a 1 cm square or something else,” he says. To date there has only been one meeting between the manufacturers and the water industry, which was well attended. At that meeting both groups deferred ongoing discussions to their peak bodies – WSAA, Accord and the AFGC. Dr Ryan says the area where the group has struggled to gain traction is working to understand the effect of messaging on consumer behaviour. Although there is no conclusive data on the impact wet wipe labelling will have on consumer behaviour, Dr Ryan says some detailed studies are starting to emerge from the US, that indicate the majority of consumers rate labelling as the most effective way to communicate how to dispose of a product. “The current labels on wipes packages can vary greatly in size and location on the product, with some labels difficult to spot because they are hidden under the seam on the back of the package,” he says.